The Corrections Division of the Chemung County Sheriff’s Office is responsible for the staffing, operation, as well as the safety and security of the Chemung County Correctional Facility. The Correctional Facility has the maximum capacity of 262 inmates. The Correctional Facility is overseen by the Office of the Undersheriff and run on a day to day basis by 1 Major, 4 Lieutenants, 4 Sergeants and 66 Correction Officers. The Sheriff’s Office also employs 20 part-time Correction Officers and 3 full-time nurses. The Correctional Facility offers a variety of programs to inmates, such as a GED Program, parenting and religious classes and a law library. The visitation schedule is Monday / Wednesday / Friday from 6:30 AM through 1:00 PM. Money will be accepted and deposited into the inmate’s accounts Monday through Friday between the hours of 6:30 AM and 1:15 PM. Inmates may also receive money the form of cash, money order or checks approved by the Chief Administrative Officer into their account through the mail. Magazines, newspapers, soft cover books (maximum of three each at a time) will only be allowed into the Chemung County Jail, if they are purchased from, and mailed to the facility by, a company whose ordinary business includes the sale and shipping of such items through the United States Mail, U.P.S., Federal Express. The Chemung County Jail provides a commissary program for the convenience of inmates and is available once weekly. Items available are those deemed acceptable for inmate needs, and are limited to, selected food and snack items, toiletries, clothing, games, and stationary products. The Chemung County Jail invites all qualified inmates to take part in a General Equivalency Diploma Program along with parenting classes or computer classes, which are under the direction of Board of Cooperative Educational Services. The Chemung County Jail offers the following inmate counseling programs. Inmates wishing to participate in the programs listed below are required to submit an inmate request form, which are available from your housing unit officer. 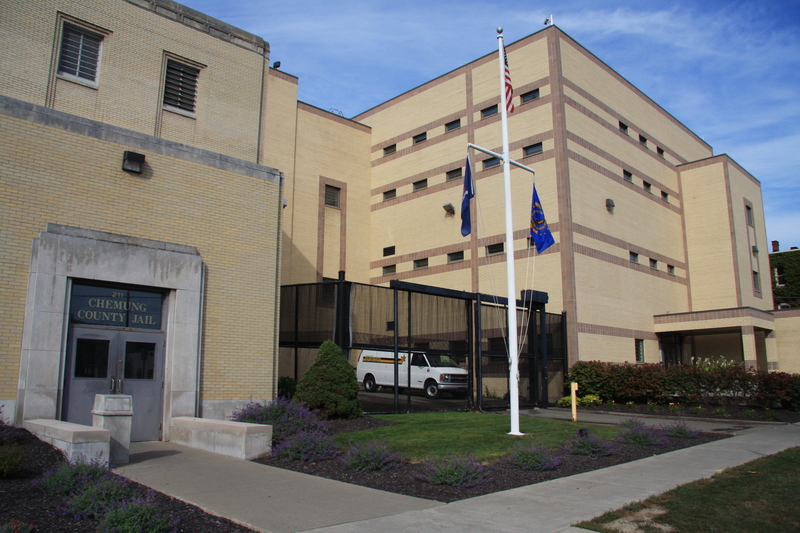 The Chemung County Jail will accept cash from individuals that want to post bail or pay a fine on inmates that are incarcerated at the Chemung County Jail. Inmates in general population will be allowed use of the telephones located in the housing areas between 0800 and 2130 hours daily.